Dia de San Juan is an amazing family-friendly, LIVE Salsa & Bachata Music and Food festival! Two $500 Scholarships awarded at the festival to South Bay High School graduates for higher education. First Thursday of each month, come out to hear Cachito y su son! WHAT: Live music during dinner! Join us for three days of high-intensity workshops with the instructors and live percussionists, performances, live Cuban bands, and social parties. -8:00 pm - 12:00 pm. *Kick off Party at Club Sur. Cafe con Leche will be serving delicious Cuban food and drinks. -10:00 am - 12:00 pm. -12:00 pm - 1:30 pm. -1:30 pm - 3:30 pm. -6:00 pm - 8:30 pm. -8:00 pm - 2:00 am. Cafe Con Leche restaurant will be serving delicious Cuban food and drinks. Visit the most touristic places in Seattle and do a flash mob dance! *Gala Night at Club Sur. *Lunch and drinks at a local Cuban restaurant Geo's Cuban & Creole Cafe. -4:00 pm - 8:00 pm. *Good Bye Party at Golden Gardens Park Beach. ¡Qué volá mi gente! Brian is starting up another class to teach you the basics of casino dancing! 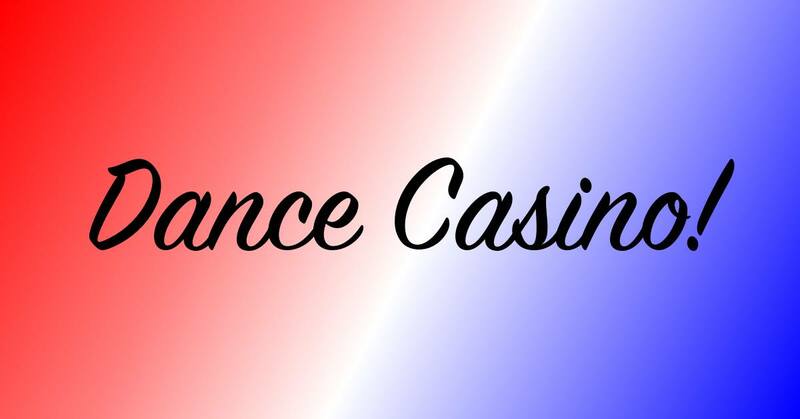 This 4-week class will teach you the fundamentals of casino so that you will be able to dance socially and in a rueda and go on to take more advanced classes! You will learn more than just turn patterns—you will learn about the structure and flavor that makes casino a unique and beautiful form of Cuban social dance! Even if you have danced casino before, you will learn something from this class! Come and be a part of San Diego's most fun and friendly social dance community! COST: $40 per person for all four classesREGISTER HERE! This is a progressive class where each lesson builds on the previous one, so drop-ins will not be allowed after the first lesson. Street parking is limited in the area, but there's usually parking available at the 29th street garage for about $1 per hour. 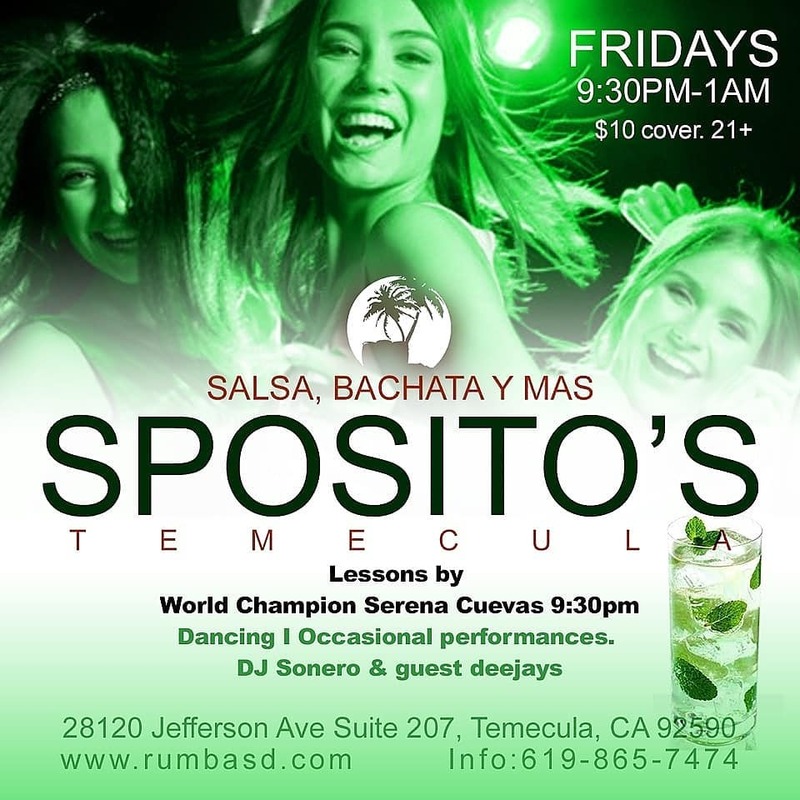 This Fridays Rueda Practice will be back at Sposito's in Temecula. This time, Maritza will get to teach a rueda lesson at 9:30pm sharp. Come support and help Maritza with the class by pairing up with a new Temecula dancer. This is the one venue that will play more timba in their mix. You have a favorite timba song, tell Maritza so we can request it. Come join us. 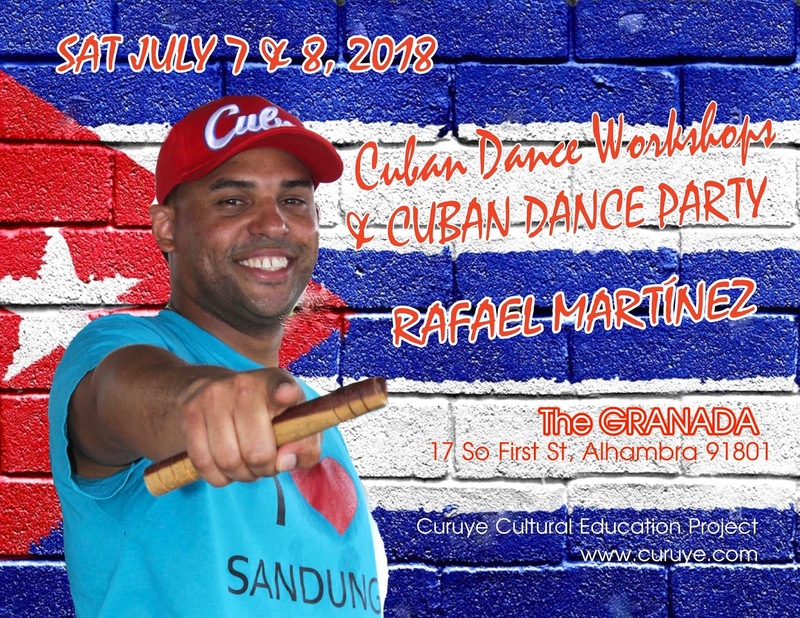 CUBAN POPULAR DANCE WORKSHOPS with RAFAEL MARTÍNEZ in L.A.
Curuye Cultural Education Project invites you to meet special guest dancer RAFAEL MARTÍNEZ who will be in Los Angeles teaching CUBAN POPULAR DANCE WORKSHOPS! WELCOME RAFAEL MARTÍNEZ, Cuban dancer, performer, and popular dance teacher from Santiago de Cuba on his first visit to the West Coast! He is the founder and director of the SANDUNGA SCHOOL of DANCE, and has traveled internationally, invited to teach and share his passion, Cuban dance! 1:20-2:45 PM: RUEDA de CASINO-INT-ADV. FREE PARKING is available in parking structure across the street from The Granada, and in the structure one block north of Main Street. 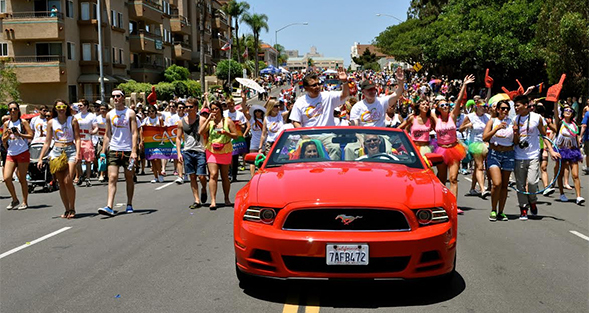 It's Summer Mi Gente and That Means San Diego Pride Parade! This is going to be our 4th year participating in the Cal State University San Marcos constituent of students, administrators, faculty and staff to walk and dance in the parade. Rocio Montlongo will be leading a salsa suelta routines as we walk in the parade. Maritza led it last year with a group of casineros and it was so much fun. If you are interested please let Maritza or Rocio know by e-mail or text. HOW TO RSVP: Click this link to RSVP with CSUSM to walk & dance in the parade. Make sure to select San Diego Rueda as your affiliation to CSUSM. IMPORTANT: Please be at the assigned Staging Zone at 10:30 am. More details to come. Plan for enough time to park and take the shuttle to the parade starting point. The later it gets the longer wait for the buses. PARADE LOCATION: Parade steps off at Normal Street and University Avenue. It runs west to 6th Avenue, south to Balboa Drive and Quince. PARKING & SHUTTLE INFO: There is free parking at The Old Naval Hospital on Park Blvd and President’s Way. (The parking lot across from the WorldBeat Cultural Center - 2100 Park Blvd., San Diego, CA 92101). This is directly across from the back of Balboa Park along Park Blvd. Free shuttle service will be available from the Naval Medical Hospital to the parade site. Shuttle service will also be provided between Hillcrest and the festival site after the parade. The shuttle drops off at the festival entrance at 6th and Juniper Street. Remember: the closer it gets to 11:00 am the longer it takes to get on a shuttle to get to the parade. Many people were late due to the increased wait to get on the shuttle. This Fridays Rueda Practice will be a social meet up to dance casino and dance rueda at a regular Latin night social. This time we are going to Sposito's in Temecula. It's an Italian/Cuban Restaurant and they play timba. Come join us. This is a 4-month commitment to complete Beginner Level 1, 2, 3 and a month of clean up of all the Beginner level moves. There are NO Drop-in's and NO make up classes for this series. The purpose of a closed series is to raise the level of the dancers's knowledge/skill to the next level as a group. 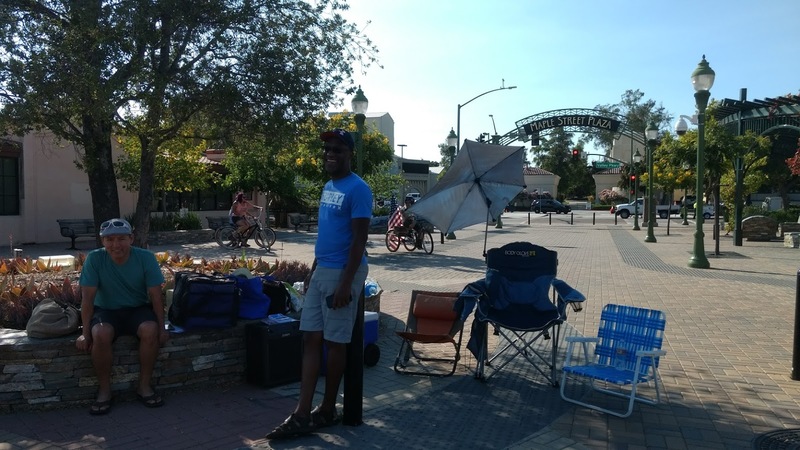 We've made this a tradition now going on it's 3rd year to meet up for 4th of July in Escondido at Maple Street Plaza. This will be the July installment for Casino on Concrete. Casineros get together at Maple Steet Plaza, set up chairs and bring food and drinks. We bring the music and dance as the sun goes down. Just across the street is the FREE 4th of July Celebration event sponsored by the Center for the Arts in Escondido, with a beer and wine fest and live music (no salsa though). Click this link to get the details about the event at the center. However, where we set up our chairs, there will be timba and dancing. This is the best place to watch the fireworks. Enjoy dancing with old friends and be ready to make some new ones. We will have an awesome playlist, glow in the dark ruedas and of course fireworks. This is a potluck, please bring something to share. We also recommend bringing lawn chairs, and sunscreen! 6pm-9pm - Casino at the Plaza(or where ever we can find a big space to dance). WHERE: Casineros Meet Up Location at 4pm at Maple Street Plaza near the big tree. Click this link for direction. Festival with VIP Beer Tasting at California Center for the Arts - 340 N Escondido Blvd, Escondido, California 92025 click here to purchase VIP Beer Tasting tickets. HOW TO PREPARE: Bring beach chairs, sunblock, hats, a portable charger for your phone, glow bracelets (from the Dollar Tree) and bring food and/or drinks. Maritza will bring music, sound system, glow bracelets for a "glow-in-the-dark rueda and salsa suelta"
It's BACK!!!! Fourth Saturday of the month Timba, Casino, and Rueda de Casino part!!! Let's hang out in PB for amazing tapas, drinks, and dancing at our local Timba-supporting-bar-and-restaurant! Come early for great food and most likely live music playing! WHAT: $10 cover at door. If you purchase $20 in food/drink, you get your cover charge back. Please pay the $10 cover using this online link to the menu, look for "cover". WHEN: Saturday, June 23rd. 9pm - 1 am. A lot of you have been asking for Afro-Cuban workshops in North County and now this is your chance to get some instructions from a world known Artist. Kimberly is amazing and you will not be disappointed! She has been featured in magazines, has her own DVD’s and has travelled all over the world teaching and performing. She spends the majority of her time in Cuba and has learned from and trains with the best of the best. We have been trying to make this happen for some time and luckily for us the stars have finally aligned, this will be a real treat that you won’t want to miss! Kimberly Miguel Mullen, M.A. is an international touring dance artist and cultural ethnologist who travels the world to create links among cultures through the expression of dance. The Los Angeles Times has described her movement as "spectacularly supple," owing to her natural beauty, grace and technical expression of sacred and secular cultural dance forms from the Caribbean, Cuba & Brazil. Among her many achievements over the course of her 20+ year professional dance career, she is a University Dance Professor, a solo performance artist, an international award winning DVD artist & choreographer, Retreat facilitator, and Co-Founder of Tambor Y Danza Cuba, a cultural arts Drum & Dance Immersion Program in Cuba. Kimberly offers spirited AfroCaribe (mainly AfroCuban) & AfroBrazilian dance classes, workshops, residencies, retreats and cultural arts immersion programs worldwide. She has been featured globally in major Publications and Magazines: Vogue India, Kee Magazine Hong Kong, ELLE, US Magazine, Oxygen, Fitness, Health Magazine, Women's World and People, etc. In 2012, she was featured on the cover of Conscious Dancer Magazine's dance travel issue. Kimberly divides her time between the United States and the Caribbean.